We're not just talking about an airplane, but an entire airport that's named after the famous manga and anime character Detective Conan. The character appears in the series known by the same name (though, in North America and the UK, the manga and anime are called Case Closed). 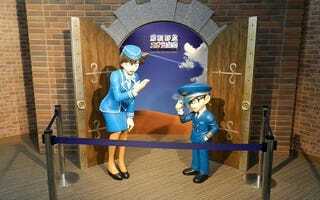 Websites AnimeAnime, Natalie, and ModelPress were at yesterday's opening ceremony for Tottori Sand Dunes Conan Airport. Yes, that's its official name. Here is a street sign to prove it. The front of the airport says "Tottori Sand Dunes Conan Airport" and has a picture of the character. There are Conan Airport buses. Inside, there are Conan posters. The floor is covered in Conan. Tottori is famous for its naturally occurring sand dunes, and Detective Conan's creator Gosho Aoyama is a Tottori native, making this an interesting way to honor both. Fun fact: Manga creator Shigeru Mizuki of GeGeGe no Kitaro fame is also from Tottori!